South Africa 9-145 (Hashim Amla 43, Faf du Plessis 24, Ahsan Malik 5-19) beat Netherlands 139 (Stephan Myburgh 51, Tom Cooper 16, Imran Tahir 4-21, Dale Steyn 2-19) by six runs. The Proteas scored 145 runs for the loss of 9 wickets in 20 overs and the Netherlands was bowled out at 139 with eight balls to spare. 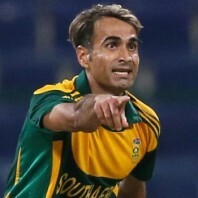 Imran Tahir (South Africa) was announced ‘Player of the match’ for his match winning bowling spell. The ICC World T20 – 21st match, Group 1, was played on Thursday, March 27, 2014, at Zahur Ahmed Chowdhury Stadium, Chittagong. Earlier, Peter Borren won the toss for the Netherlands and invited South Africa to bat first. The first wicket was lost at just three runs when Hashim Amla along with his skipper, Faf du Plessis, started the consolidation process. The first dispatched 22 runs in the third over with 1 six and 4 fours and was gone at 45 for 43. AB de Villiers got in next and took the score to 84 in 8.5 overs as du Plessis became the next victim for 24 and his partner departed eight runs later for 21. Ahsan Malik penetrated through the strong looking batting line up of the Proteas who reached 9-145 after 20 overs. Ahsan Jamil achieved his best bowling figures of 5-19 whereas Michael Swart, Timm van der Gugten, Logan van Beek and Tom Cooper shared one wicket each. Stephan Myburgh and Michael Swart took off smartly and surprised the rival bowlers from the beginning. The first was the most attacking of the two and scored 40 runs from just 20 balls. The partnership was broken at 58 when Swart departed for eight and was replaced by Wesley Barresi. Myburgh powered his third T20 fifty on the 25th delivery but was clean bowled by Jean-Paul Duminy for 51 off 34 comprising 2 big sixes and 8 fours. Imran Tahir brought his side back in the game while grabbing four quick wickets within no time. The batsmen were unable to sustain the pressure of the quality bowling from the Proteas and the entire Dutch side was sent back to the pavilion for 139 in 18.4 overs. Imran Tahir was the supreme wicket taker with four, Dale Steyn held two whereas Ben Hendricks, Lonwabo Tsotsobe and jean-Paul Duminy held one wicket each. South Africa triumphed in the thrilling encounter with a narrow margin of six runs and got two valuable points.